45 minutes later I had purchased a PSOne and gutted it. Sure enough, it seemed pretty simple. And the best part was, it has an external power adapter, similar to the older game systems. Therefore, the PSOne has a simple 7.5 volt input jack for power. 7.5 volts, the same as a Sony Info lithium rechargeable camcorder battery, just like my current VCSp’s use. HM…. I grabbed a Casio EV-550 pocket TV I had laying around. I hooked it and the PSOne up to the battery. Sure enough, it ran. But the power consumption was high, about 1.2 amps (with both screen & PSOne). The solution was to remove the bulb from the TV and replace it with 2 white LED’s, similar to my VCSp Gold. Upon doing that, the TV’s power consumption went from 500mA to 250, right clean in half. Here is the thing all wired together, running Strider 2. You can see the battery at the bottom of the shot. The spinning disc can be used to hypnotize wild animals and slice tofu. Initial tests showed this setup consumes an average of 840mA, which is about the same as a VCSp! Despite the spinning disc & motors, the Playstation circuitry, this is going to come as a shock, is much more advanced than an Atari, thereby resulting in better power efficiency. 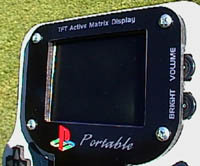 Running non-stop on a fully charged NP-550 battery, the unit will operate for about 1.45 hours, or long enough to perform 3 spells in Final Fantasy VII. Work feverishly commenced on the case for the PSp, as I had dubbed it. I spent several hours measuring stuff with my trusty dial caliper. One thing I knew for sure, the unit had to have the Dual Shock control sticks. The rumble feature would have to go take a hike, it just sucked way to much power. Also, it had to have a memory card slot and a second player controller port so I could whoop up on people in Street Fight Alpha 3. After a terrible Tuesday that none will forget, it took me a few days to get back to work on this thing. But I realized that we all must carry on, for if we let the tragedy affect our normal routines, ideals & dreams for too long then terrorism has won. And we can’t let that happen. In the smash hit 1989 movie “Back To The Future Part II”, Marty escapes the Cafe 80’s and runs into the park. He then grabs a Hover board from a little girl. Well, if you look close the girl has a CD player on her head. It’s just a knob holding the disc in place and the disc spins freely in the air. WELL! I thought, if it’s good enough for the Year 2015, it must be good enough for my project. As you can see by the above picture, I skipped all formalities such as ‘drive doors’ and ‘disc covers’. The center motor has those little metal balls that actually hold the disc down and the disc spins freely (it cools your fingers while playing, no, really!). The black edging that looks like a smile keeps your fingers from hitting it. 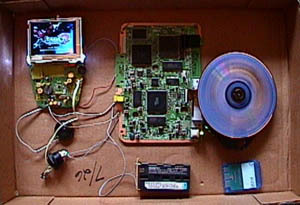 The CD assembly is one portion of the rear, it screws to the thin back-plate which has the battery connector. The battery holder on this unit is the same as a VCSp Rev 3 and Gold. In the middle of the back-plate you can see some holes, that’s where the shoulder buttons will go. In total 5 pieces have to be screwed together to form the PSp, as opposed to 2 pieces for a VCSp. Note: The CD assembly from the PSOne had a VERY short data ribbon cable so I had to buy a used 1995 model Playstation from Funcoland and use its ribbon cable. I also had to extend the cable that powers the motors. It was time to start putting the controls and other objects into the now-finished cases. The front of the case is your standard inch-thick Ben Heckendorn special. One difference between it and the VCSp case however, was that the PSp required about 7 different screw post sizes inside, whereas the VCSp has 1. 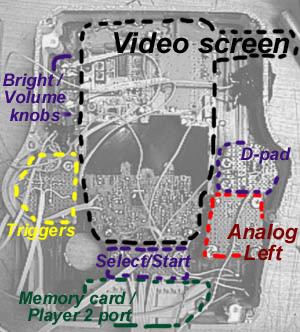 The above photo has a good view of the Memory card / Player 2 port at the base of the unit. It was time to start wiring things together. 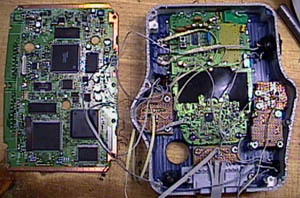 On the left is the >somewhat< hacked up PSOne board and the front half of the case, viewed from the rear. At this point, only power, audio & video are hooked up, no connections have been made to the control pads. The right-hand photo has some lines indicating what things are. Video screen, triggers, D-pad, both analog sticks, Select & Start, volume & brightness controls, power ON switch, video out, DC in AND the PSOne board itself. Now, consider a VCSp Rev 5. The front half of the unit contains the screen and controls. The back half of the unit has the Atari motherboard, power jacks and battery. To be fair, the PSOne board is thinner than an Atari board, but I was still biting off a lot to chew with my goal. But, through careful positioning I was able to fit all those things in 15/16th’s of space. (Remember, the case is 1 inch thick but 1/16 of that is the front panel) One boon to me was to have the curved ‘flair-outs’ on the sides of the unit. This allowed the joy pad and triggers to ‘get out of the way’ of the other stuff, namely the screen. One problem that occurred, when screwing the unit together the wires all bunch up, something I don’t always consider in the design phase! But, after a while it all fit together. The screen cover is black acrylic plastic, unlike the wooden one on the VCSp. It gives this unit a sleek, modern look. Also here’s a shot of the trigger buttons up close. I didn’t anchor the buttons to keep them from rotating, it seemed unnecessary and I can still recognize a triangle on its side. Ah, no better way to spend a Saturday afternoon than relaxing with a game of Symphony of the Night! In the end the project cost about $400 to create, half of that just for the screen! But it was worth it. Here’s a Video File of the PSp in action. How much does a Portable Playstation 1?